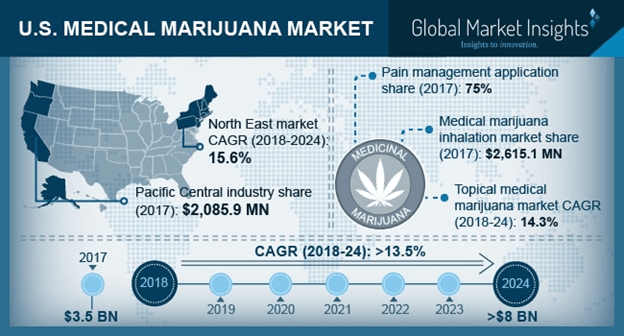 U.S. Medical Marijuana Market size is set to exceed USD 8.0 billion by 2024; according to a new research study published by Global Market Insights, Inc. Growing prevalence of chronic pain associated with neurological disorders, cancer, HIV/AIDS, and arthritis will drive the U.S. medical marijuana market. The preference of marijuana over opioid medication is also boosting market revenue in the U.S. as opioids are associated with various side lethal side effects. Therefore, the demand for medical marijuana is continuously on an upsurge in various U.S. states, thereby accelerating market sales. Medical marijuana programs in the U.S. have continued to develop, and most of the states have started to approach medical marijuana from the perspective of public health rather than from a recreational use prospective. Various states in the U.S. have demonstrated positive public health outcomes through the application of medical marijuana, hence boosting the marker size. The U.S. medical marijuana pain management market segment is forecasted to grow rapidly at 13.3% CAGR during the forecast period. Growing cases of chronic pain which is the most common cause of long-term disability in the United States will drive the segment growth. In addition, the U.S. population has been using marijuana for pain management as compared to other traditional opioids which have lethal side-effects. The U.S. topical medical marijuana market segment valued USD 179.3 million in 2017. Increased number of companies are manufacturing lotions and creams that are absorbed through the skin for localized relief of pain and inflammation. Furthermore, topical route of administration is preferred by most of the patients as it results in maximum therapeutic benefits without the cerebral euphoria associated with other delivery methods. The U.S. medical marijuana dispensaries market segment will expand at a robust 13.3% CAGR over the forecast period owing to presence of number of legal dispensaries operating in a most of the states. With each state legalizing marijuana for medical purposes, more and more dispensaries are being set up in the country, hence propelling the market growth of the segment. California medical marijuana market is estimated to grow at 13.7% from 2018-2024. Medical marijuana is legalized in California since 1996. The manufacturing, distribution, transportation, and sales of medical marijuana is completely legal in California, thereby boosting the market growth in the coming years. New Hampshire medical marijuana market is forecasted to expand at 24.1% CAGR during the forecast period. New Hampshire ranked second in the country for the highest opioid overdose rate. With the legalization of medical marijuana, it will result in improvement of health outcomes for individuals suffering from pain, thereby driving the segment growth in the long run. Prominent industry players in U.S. medical marijuana market include Canopy Growth, Aurora Cannabis, Inc., Medical Marijuana, Inc., GW Pharmaceuticals, Aphria, Inc., CanniMed Ltd., Tilray, Emerald Health Therapeutics, and United Cannabis. These companies are opting for strategic mergers, acquisitions, and partnerships to expand their geographic reach, and product portfolio, hence resulting in improved position in the overall market.